More than the most prestigious regatta and match race in the sport of sailing, the America’s Cup is a test of boat design, sail design, fundraising, and management skills. It is not surprising that its passionate skippers, builders and managers should often become embroiled in disputes. Recognizing this, and to minimize jurisdictional issues, the Cup’s organization has included its own international jury for over thirty years. The 31st jury, however, for the first time in the Cup’s long and colourful history, appointed a five-member arbitration tribunal which has now become an established part of the Cup’s ‘corporate’ identity. Although the tribunal’s decisions are not intended to be binding in the future, experience has already proven that they may assist whoever is involved in forthcoming competitions. In validation of this recognition, this book compiles all the decisions issued by the tribunal about cases submitted to the 32nd jury. This entails forty-three decisions in all, encompassing decisions on the merits for thirty-six cases, as well as a series of interim, provisional or partial decisions and, in one case, a dissenting opinion. on-board installation of TV equipment. 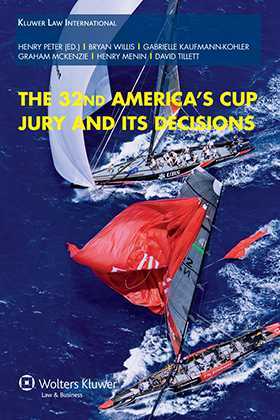 In addition to the full texts of the decisions, the book includes the America’s Cup Deed of Gift (the ‘constitutional’ document), the Protocol governing the 32nd America’s Cup, Rules of Procedure, Terms of Challenge, and applicable anti-doping and anti-gambling rules. A valuable introduction offers, as well as historical and legal background, some personal perspectives by Jury members. Perhaps the most interesting aspect of this subject for practitioners in general is the symbiosis quickly established between the America’s Cup organization and the World Intellectual Property Organization (WIPO). At the request of the Cup’s management, WIPO developed a customized web-based facility for the rapid and secure resolution of disputes – a facility now available in the context of other sporting events and for intellectual property disputes in general. With detailed information on this system, along with the book’s many insights into the kinds of issues that fuel disputes in sports events (and their resolutions), Arbitration in the America’s Cup offers a significant extension of the knowledge base available to lawyers and scholars in several branches of law and legal practice. 1. Introduction. 2. Deed of Gift of 24th October 1887. 3. The Protocol Governing the Thirty Second America’s Cup (consolidated version 12 May 2006). 4. Rules of Procedure. 5. Other Thirty Second America’s Cup Governing Documents. 6. The 32nd America’s Cup Jury Decisions.